Welcome to our free Introduction to CSS tutorial. This tutorial is based on Webucator's Introduction to CSS Training course. In this lesson, you will receive a crash course in the uses of CSS. Understand the benefits of Cascading Style Sheets. Use styles to redefine how elements are formatted. Understand and use different CSS selectors. Understand and use CSS combinators to narrow CSS selections. Understand and use CSS Resets. Understand and use CSS Normalizers. Use external stylesheets, embedded stylesheets, and inline styles. Use <div> and <span> elements. Understand and use the viewport meta tag. Use the different units of measurement available in CSS. Understand how browsers style pages. Since HTML 4.0, most HTML formatting elements (e.g., u for underline) and attribute (e.g., bgcolor for background color) have been deprecated, meaning that, although they may still be supported by browsers, the World Wide Web Consortium (W3C) recommends that they no longer be used. Web designers are to use CSS instead. Better for search engine optimization. Style rules can be applied to multiple pages. Precise control of position, size, margins, etc. Developers develop / Designers design. No need to misuse tags (e.g., <blockquote> for formatting). No need for invisible images for positioning. Users' stylesheets override authors' styles. This rule specifies that all paragraph text should be darkgreen and use a 1.5em Verdana font. This rule specifies that the text of every p element should be darkgreen and use a 1.5em Verdana font. Attribute selectors specify elements that contain a specific attribute. They can also specify the value of that attribute. The universal selector is an asterisk (*). It matches every element. Combinators allow for the selection of elements based on the relationships between selectors. With descendant selectors, generations can be skipped. In other words, the code above does not require that the strong element is a direct child of the p element. In this case only strong elements that are direct children of p elements are affected. I'm not in a strong or em element. In this case only strong elements that are siblings of and immediately follow em elements are affected. In the HTML code shown above, only the first strong element (with the text "Hi there!") would be red. The rule with the more specific selector takes precedence. In the event that two selectors have the same specificity, the rule specified later in the document takes precedence. Adding !important to any CSS declaration will give that declaration the highest specificity, but please note that using !important is bad practice, and should be avoided. See https://developer.mozilla.org/en-US/docs/Web/CSS/Specificity#The_!important_exception for more information. <a href="https://www.runnershome.com">a link to Runners Home</a>. The headings are bold, have varying font sizes, and have margin before and after them. All of the elements, except the link, are on their own blocks as if they had <br> tags before and after them. The unordered and ordered lists come with bullets and numbers, respectively. The link is blue and underlined. It is important to recognize that browsers add default styles to HTML pages because often you will use CSS to add to or override these default styles. CSS resets are used to remove most default styles that browsers add to HTML elements, so that designers can decide on these styles themselves. For example, header tags will no longer be big and bold. By resetting the default styles, the designer gets rid of inconsistencies between browser default styles, opening the door for them to add styles that are rendered the same by all browsers. CSS normalizers are slightly different from CSS resets. Instead of getting rid of all styles, they adjust styles so that they are consistent between browsers. In doing so, normalizers have to choose some styles over others. As such, normalizers are opinionated, meaning that the authors of these normalizers have made design choices based on their own preferences. For the rest of this course, we will be using a slightly modified version of a normalizer called normalize.css in all of our files. normalize.css is the normalizer used by Bootstrap to improve cross-browser rendering. External stylesheets are created in separate documents with a ".css" extension. An external stylesheet is simply a listing of rules. It cannot contain HTML tags. Throughout this course, we will mainly be working with external stylesheets. CrashCourse/Demos/styles.css is an example of an external stylesheet. The above CSS file can be included in any number of HTML pages. The <link> tag, which usually goes in the head of an HTML page, is used to link to an external stylesheet. There is no limit to the number of external stylesheets a single HTML page can use. Also, external stylesheets can be combined with embedded stylesheets and inline styles. This page will render the same as the HTML page with the external stylesheet. Please note that it is bad practice to use inline styles in production code; however, they can be useful for testing and debugging. Duration: 25 to 40 minutes. 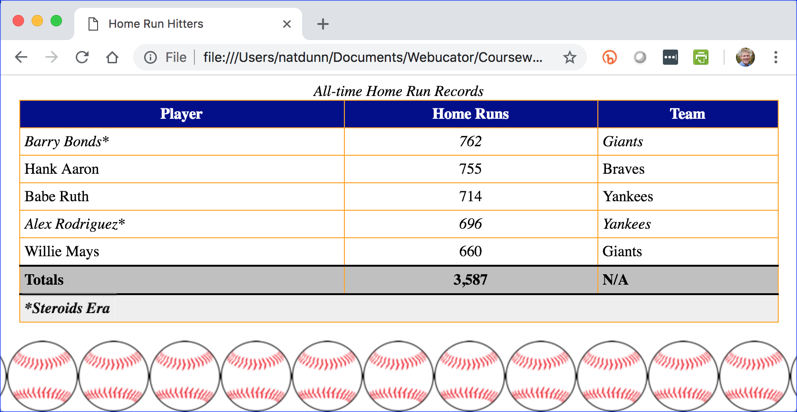 In this exercise, you will add several simple rules to an external stylesheet and link to it from CrashCourse/Exercises/index-external-styles.html. Do not worry about learning the CSS properties and values at this point. This exercise is just to give you some practice creating a stylesheet. Open CrashCourse/Exercises/index.html in your editor and save it as index-external-styles.html. Create a new file and save it as styles.css in the same directory. 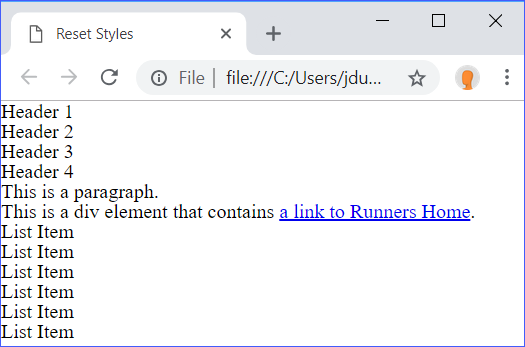 Add a <link> tag with an href value of "styles.css" and a rel value of "stylesheet" in the head of index-external-styles.html. 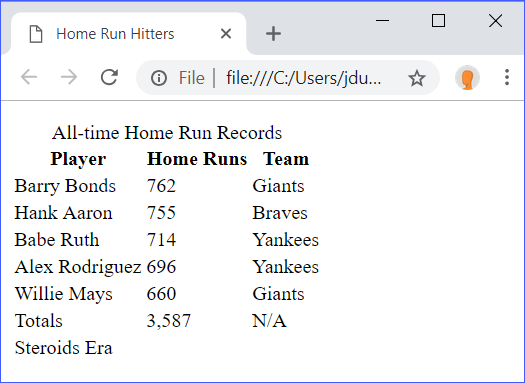 Assign a class of "steroids-era" to the table rows containing Barry Bonds and Alex Rodriguez. Assign an id of "key" to the second table row in the tfoot. In this exercise, you will replace your external stylesheet with an embedded stylesheet. Open CrashCourse/Exercises/index-external-styles.html in your editor and save it as index-embedded-styles.html. Remove the <link> tag, and add a style block. Copy and paste all the CSS rules from styles.css to the style block in index-embedded-styles.html. Open index-embedded-styles.html in a browser. 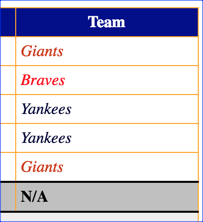 It should look the same as index-external-styles.html did. In this exercise, you will add some inline styles. Open CrashCourse/Exercises/index-external-styles.html and save it as index-inlines-styles.html. The <div> and <span> tags are used in conjunction with Cascading Style Sheets. By themselves, they do very little. In fact, the <span> tag has no visual effect on its contents. The only effect of the <div> tag is to block off its contents, similar to putting a <br> tag before and after a section on the page. Like all tags, the <div> and <span> tags can take the class, id, and style attributes. It is through these attributes that styles are applied to the elements. Unlike p (paragraph) elements, main (main content) elements, header (header content) elements, etc., div elements and span elements do not inherently represent anything. 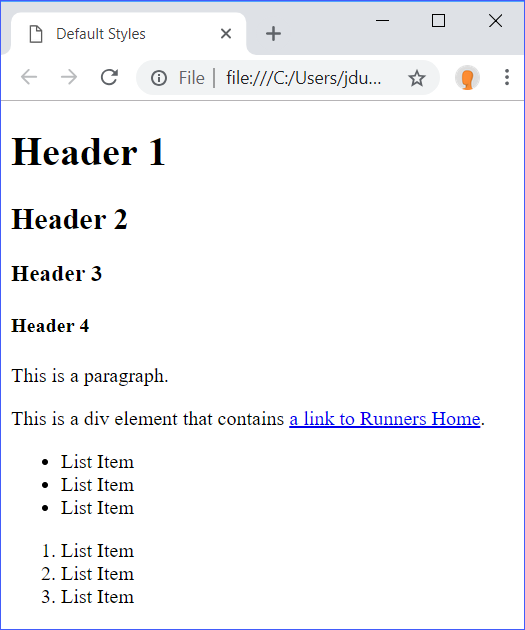 div elements are generic content containers for flow content and span elements are generic containers of inline elements. <span>this text is also in a span</span>. There are no step-by-step instructions. Review the rules in the external stylesheet and apply classes and ids as appropriate. To define the media type for an entire external or embedded stylesheet, the media attribute is added to the <link> or <style> tag, and assigned the value of a media type. If the media attribute is not included, the media type defaults to all. It is also possible to target multiple media types within one stylesheet using @media. @media is a powerful CSS tool, and we will later look at how it can be used to target not just the type of media but also aspects of the user's device: screen width, screen height, orientation, etc. This is done with media queries. Media queries allow us to craft pages that are responsive, presenting different layouts for desktop computers, tablet devices, and smartphones. This is called the viewport meta tag and it is used to help pages adjust correctly for all devices. For more information see https://developer.mozilla.org/en-US/docs/Mozilla/Mobile/Viewport_meta_tag. CSS allows for the use of many different units when specifying property values such as font size, border size, margins, etc. However, standards have been established to decide what units to use for different media types. In this course, except where specifically stated, you will be designing for screen. Note that units of measurement and sizing will be covered throughout the course. 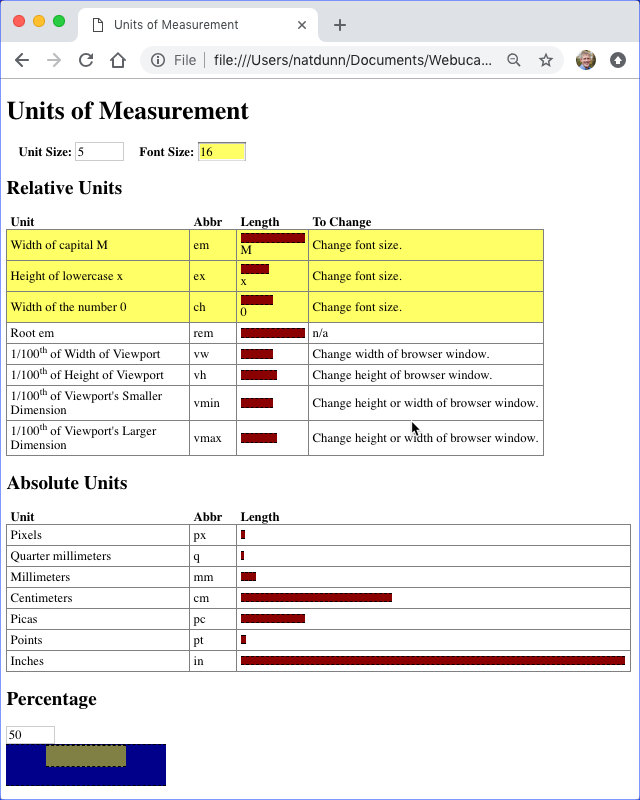 In this section, we provide a general overview of the different units of measurement. Absolute units have a basis in the physical world, although their actual size on the screen depends on the resolution and size of the user's device. When designing for screen, it is standard to use pixels for absolute units. Relative units are relative to the size of other things (e.g., window size, font size, container element size, etc.). When designing for screen, it is standard to use ems, rems, and percentages for relative units. Pixels are the only recommended absolute unit to be used when designing for screen. A common practice is to use pixels to set root font sizes for different screen and window sizes. This allows for designs using mostly ems and rems to adjust between different screen and window sizes because ems and rems are relative to font size. It is recommended to use ems and rems for almost everything when building responsive designs for screens. The exception to this rule is widths, which are more often defined in pixels or percentages. An em is the size of the font size for the current element or the parent element. For example, if the font-size of p elements is set to 14px, then in a p element, 1em is 14px. Rems are similar to ems, except for one key difference. 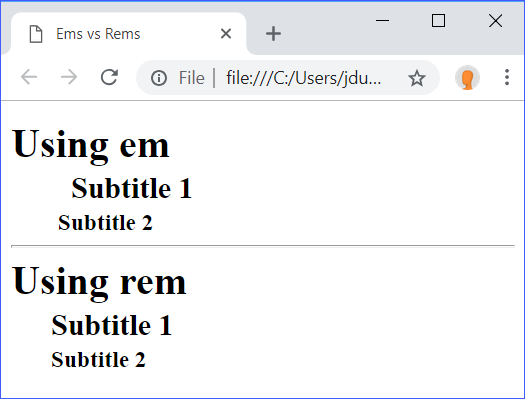 The 'r' in rem stands for 'root' because 1rem is always equal to the root font size (the font size set for the html element) regardless of what element it is in. This means 1rem is consistent throughout the page, while 1em is not. Both ems and rems can be used to accomplish the same things. Notice that "Subtitle 1" and "Subtitle 2" do not line up in the Using em section, but do line up in the Using rem section. This is because the ems are relative to the font sizes of their respective header elements, while the rems are not. Percentages are most often used to create flexible layouts that change to fit the size of the browser window. When specifying a value such as width or height in percentages, the percentage is relative to the size of the containing element. For font size, percentages work the same as ems. 100% is equal to the inherited font size, so 100% is essentially 1em when specifying font size. It is most common to use percentages to specify values like width and height to create "fluid" boxes that grow and shrink to fit within the browser window. Inches (in), centimeters (cm), millimeters(mm), points (pt), and picas (pc) are all absolute units that are most often used when designing for print. You might also run into viewport units, which are relative units based on the size of the viewport (browser window). vw and vh specify sizes relative to the user's viewport width and height, respectively. vw is 1/100th of the viewport's width. vh is 1/100th of the viewport's height. vmax specifies size relative to whichever dimension is larger (width or height). vmin specifies size relative to whichever dimension is smaller (width or height). Viewport units are used for designing for screen, but they are not as popular or as well supported as other screen units. 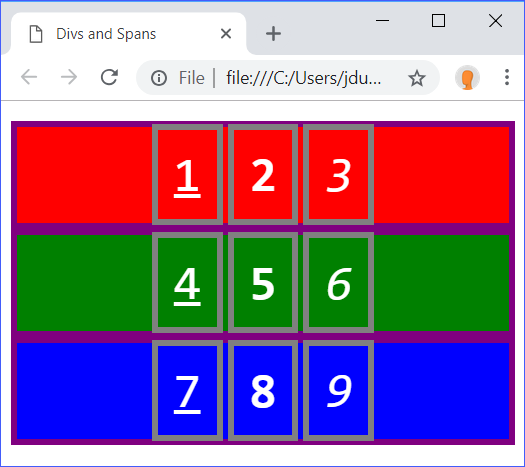 If you would like to play with the different CSS units to see how they compare on a screen, open CrashCourse/Demos/units-of-measurement.html (shown below) in your browser. By default, all CSS properties are either inherited or non-inherited properties. This difference determines what happens when a property for an element goes unspecified. Notice that the strong element has the same font size as the p element, even though font-size was not specified for it. Notice that the strong element does not also have a border. This is because the initial value for border is none. You can force a property to inherit the value of its parent by setting its value to inherit. All h2 elements are given the color blue. 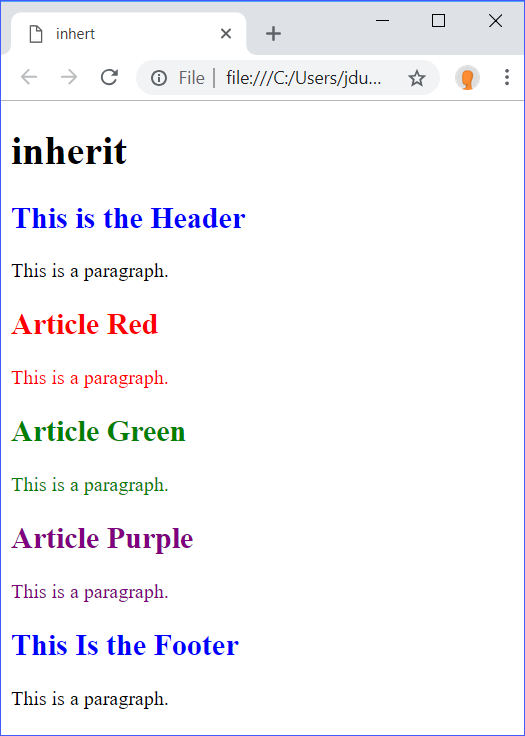 h2 elements within article elements are made to inherit the color property. Each article is given a different color. This color gets inherited by the h2 elements within them because they have color set to inherit and by the p elements because color is an inherited property.